SKU: XMaxx-GLYCOL-HT-2_5G. 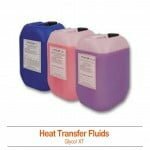 Category: Heat Transfer Fluids. Anti-freeze and corrosion-protection concentrate for cooling and heating systems as well as for solar and heating pump systems. The above data represent average values that were valid at the time when this Technical Information Bulletin went into print. They do not have the status of a product specification. Specified values are the subject of a special leaflet. The Glycol is a clear, red-fluorescent liquid with a faint odor, based on physiologically unobjectionable propylene glycol, and water. It has been designed especially for utilization fluid in solar heating equipment under elevated thermal conditions (vacuum tube collectors). The corrosion inhibitors contained in this glycol reliably protect the metals normally used in solar installations against corrosion, aging and deposits over long periods. Tyfocor® LS prevents the surfaces of heat exchangers from becoming fouled, and ensures consistently high thermal efficiency. In order to maintain its specific properties, this glycol must not be mixed with other heat transfer fluids, and must never be diluted by water. If leakages or other losses occur, the heat transfer fluid in the system must be replenished with this glycol only. Our Glycol is utilizable for solar heating equipment with high stagnation temperatures, if the following instructions are properly observed: It must be ensured that all of the heat-transfer fluid can drain out of the solar collectors into the sufficiently dimensioned expansion tanks when the maximum static temperature is reached, and thus the collectors remain completely empty. This Glycol must not be exposed to sustained temperatures higher than 338 F. Temperatures higher than 392 F lead to slow thermal decomposition of propylene glycol, which is indicated by darkening of the fluid. Due to this process the lifetime of the fluid may be strongly decreased.